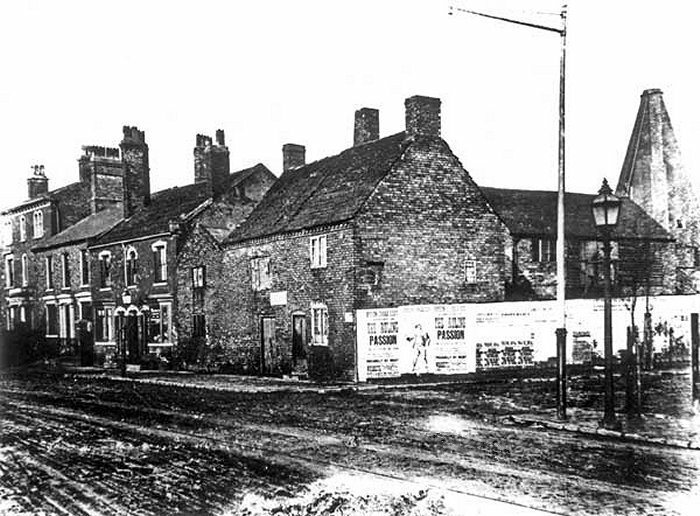 At the beginning of the 19th century, Darlaston's industry consisted of many small workshops in back yards behind people's houses, that were ideal for small family businesses producing tools, nails, gunlocks, and gun barrels etc. The first large factories were the ironworks that were built after the opening of the canal, which provided an easy way of transporting heavy items over long distances. 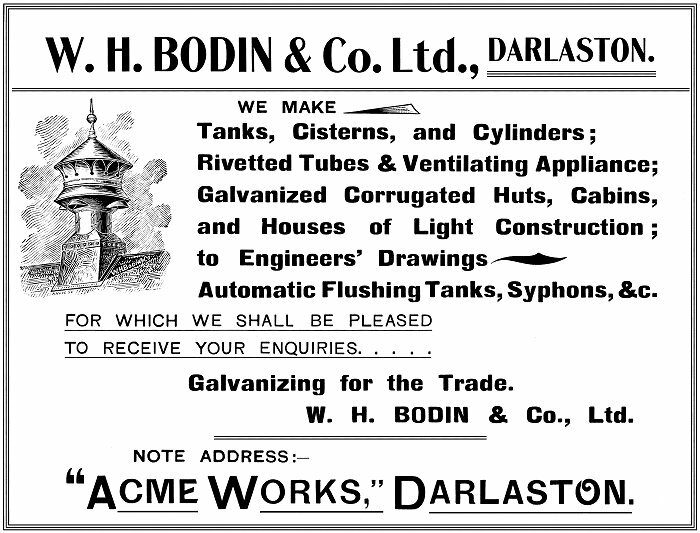 After the Napoleonic Wars the gun trade collapsed and so Darlaston's skilled craftsman began to produce other products in their small workshops. As the century progressed, the workshops grew into small factories employing larger numbers of people, which was possible because of the increase in the local population. The next step forward, the development of larger manufacturing firms happened when the railways arrived, and brought a new form of fast and reliable transport to much of the country, including shipping ports such as Liverpool. By the late part of the nineteenth century large factories had appeared, employing large numbers of people. One of the first companies in the town to have large workshops was S & R Carter of King's Hill Works, which was located off Birmingham Street, on a site later occupied by Darlaston Tram Depot. 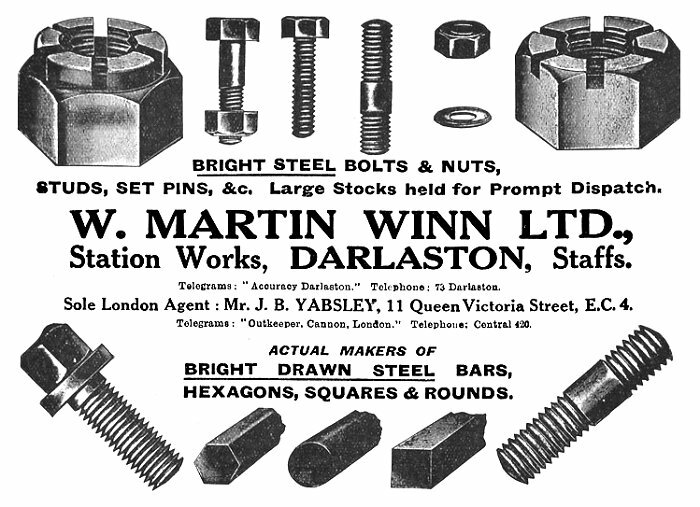 W. Martin Winn Ltd. opened their factory at Heath Road in 1907. It was a family business that started by making wrought iron nuts and bolts. 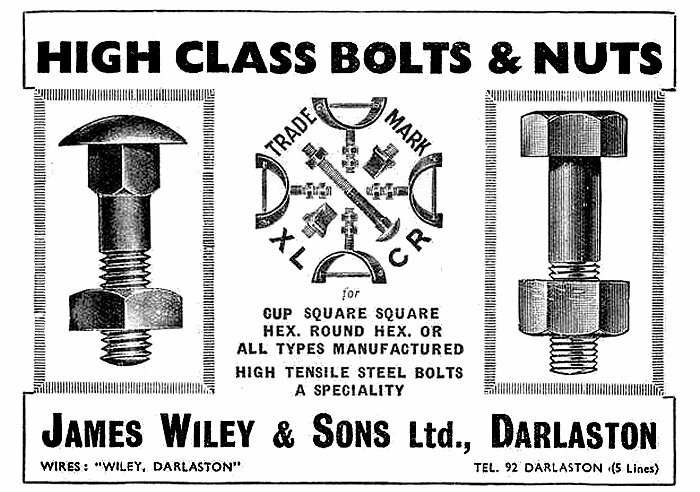 They quickly realised the advantages of steel and produced some of the first steel nuts and bolts in Darlaston. The business quickly grew and many of the company's products were produced from bright drawn steel. 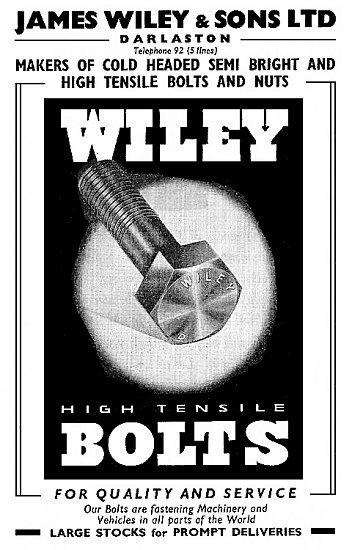 Between 1920 and 1930 the cold heading process was introduced which led to the production of high tensile steel bolts. Heat treatment was later introduced for the production of high tensile carbon steel bolts, and alloy steel bolts. They also produced extra large bolts weighing two or three hundredweights each. An advert from the 1920s. The company's founder, Mr. W. Martin Winn died in 1941. The company was then managed by Mr. W. Norris Winn, Mrs Martin Winn, and Mr. J. E. A. Jones. 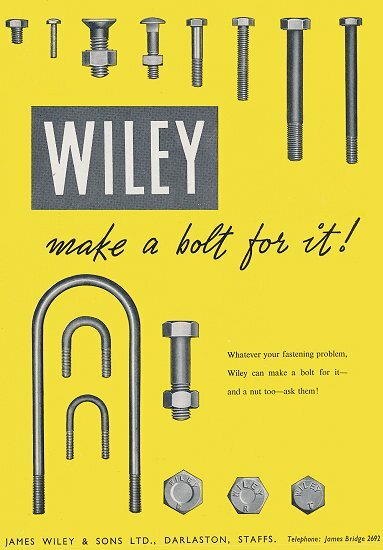 In the 1950s the firm began to produce bolts and studs that were suitable for high temperature installations. Large numbers of them were sold to oil refineries, and to manufacturers of steam raising equipment. In later years the company benefitted from the decision to introduce a unified thread to make British and American screws interchangeable. Large numbers of the firm's unified nuts and bolts were produced. 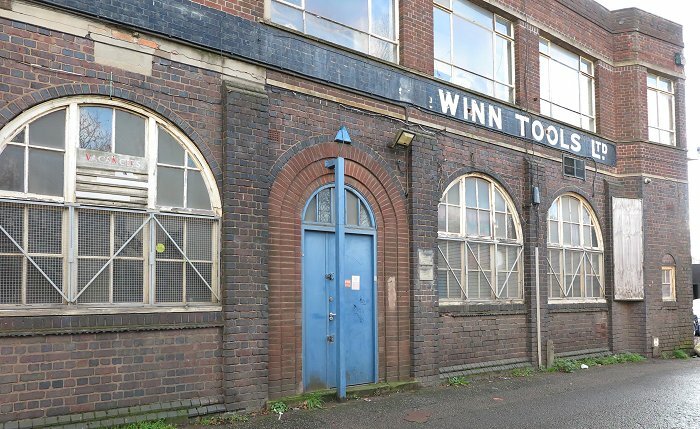 The factory closed during the recession in the 1970s, but a small tool making business called Winn Tools remained in the original office building until a few years ago. Winn Tools was founded in 1964, and survived until June 2009. 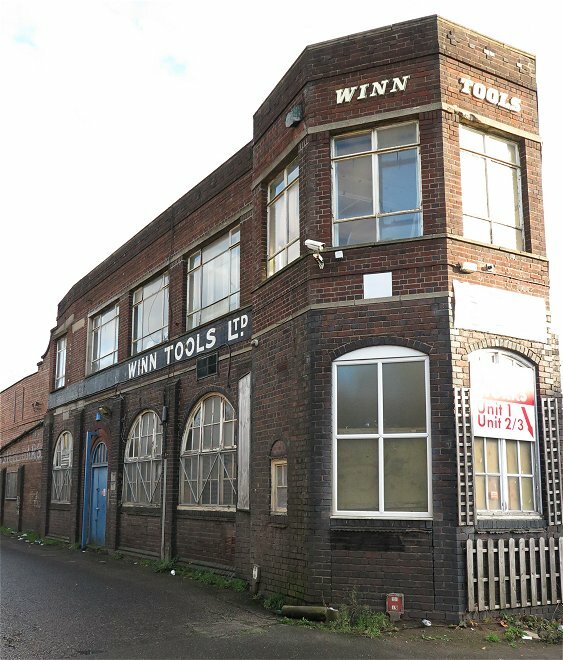 Winn Tools Limited in Kendricks Road. Another view of the old factory. An advert from 1958. 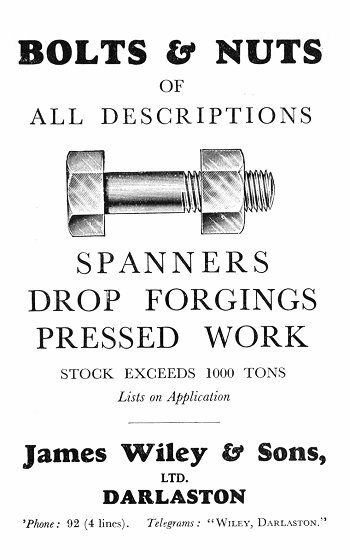 Wiley James & Sons Limited was established in 1860. 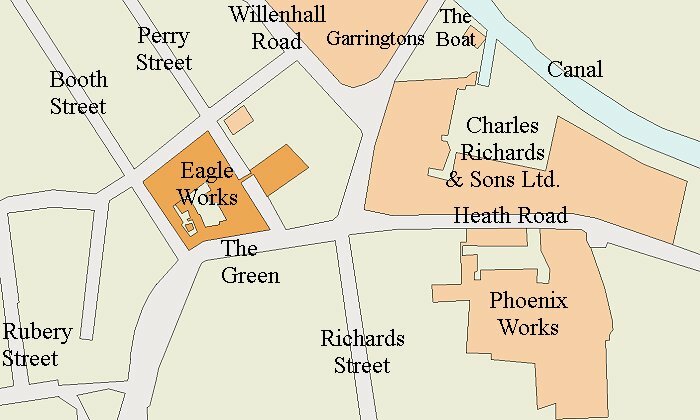 The offices and factory were at Eagle Works, The Green, Darlaston. 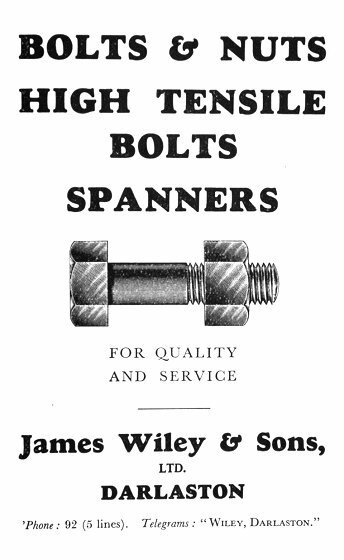 The firm manufactured all kinds of black and bright bolts & nuts, made by hand and machine in iron or steel. Other products included set screws, engineers' studs, coupling boxes, builders’ roof iron work, bed screws, handrail screws, Excelsior spout clips, horseshoe frost studs, also Norfolk, Suffolk and other latches. The firm had a large export market. The location of Eagle Works. The Staffordshire Bolt, Nut, and Fencing Company's factory, London and North Western Works, stood near Bentley Road South, in between the Walsall Canal and the London & North Western Railway. It was connected to the railway by a siding which also served the nearby canal interchange goods station. The importance of the railway to the company can be seen from the name given to the works. This advert is from 1884. An advert from 1865. Providence Works at The Green was run by Simpson & Company, and later Simeon Archer and Thomas Harper. The firm went into liquidation in the autumn of 1878 and was acquired by The Staffordshire Bolt, Nut, and Fencing Company. 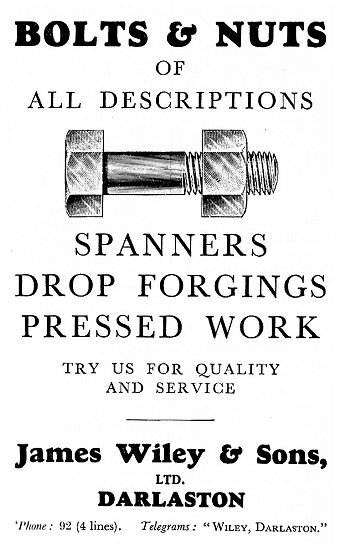 An advert from 1905. Vulcan Foundry was at the western end of Heath Road, opposite Charles Richards' Imperial Works. 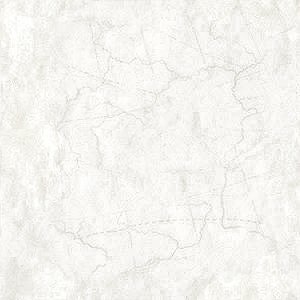 Sometime before 1850, Simeon Partridge, a grocer, began to make tallow candles for sale in his shop at 28 Pinfold Street, which he produced in a small backyard workshop. He soon opened a small factory behind Slater & Company (solicitors) in Walsall Road, not far from the Bull Stake. Unfortunately the building burned down in 1900 and manufacturing ceased. His son Alfred soon opened another factory on the southern side of Heath Road next to several old flooded mine shafts, one of which supplied the works with water. Products included tallow candles, yellow and carbolic soap. The factory on the corner of Walsall Road and Crescent Road. From the collection of the late Howard Madeley. The candles were made by repeatedly dipping candle wicks, suspended from a frame, into molten tallow, until the required thickness was obtained. After each dipping the tallow was allowed to cool. One ton of tallow made around 25,000 candles, and in a record year in the 1930s the company made 4,000 tons of candles of various kinds. In 1910 Gilbert Partridge took over at the works which were sold to ESSO Limited in 1957. Within a few years the factory closed. 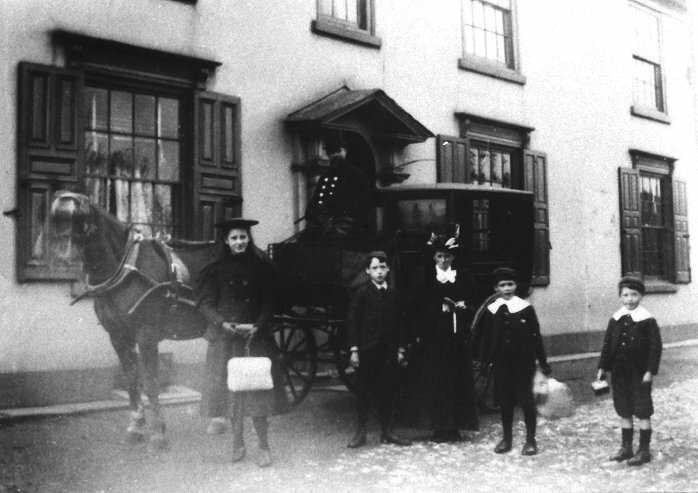 The Partridge family outside their home, Mill House, in Dorsett Road. From the collection of the late Howard Madeley. An advert from the mid 1950s. Chapel Street was on the site of the flats by King's Hill Park. Courtesy of Christine and John Ashmore. Enoch Wilkes & Company Limited of Britannia Works was purchased by Enoch Horton &Son in the late 19th century. It went into voluntary liquidation on 13th July, 1923. Albert Enoch Horton was appointed as liquidator. The factory was then taken over by G.K.N. Simeon Taylor had a shop at 76 Pinfold Street, where he sold sports goods, and repaired bicycles at the back. He suffered from hearing difficulties and so his wife helped in the business. The Taylor family lived upstairs above the shop and had several children. Simeon built a workshop and started to assemble bicycles. It became a family business. Simeon's daughter Florence, sons Jack and Richard, grandsons John and Philip, and granddaughter Lynda also worked at the factory. They became well known for their high standard of craftsmanship. Simeon died in 1960 after a long illness. By this time half of the company's products were exported, and many competitors had ceased to trade because of cheap foreign competition. Comrade went on to become the largest independent cycle manufacturer in the country. The company was hit by the recession in the late 1970s and 1980s, and moved to new premises near the Bull Stake. Unfortunately it all came to an end in 1987 because of the continuing recession, and the large number of cheap foreign imports that flooded the market. 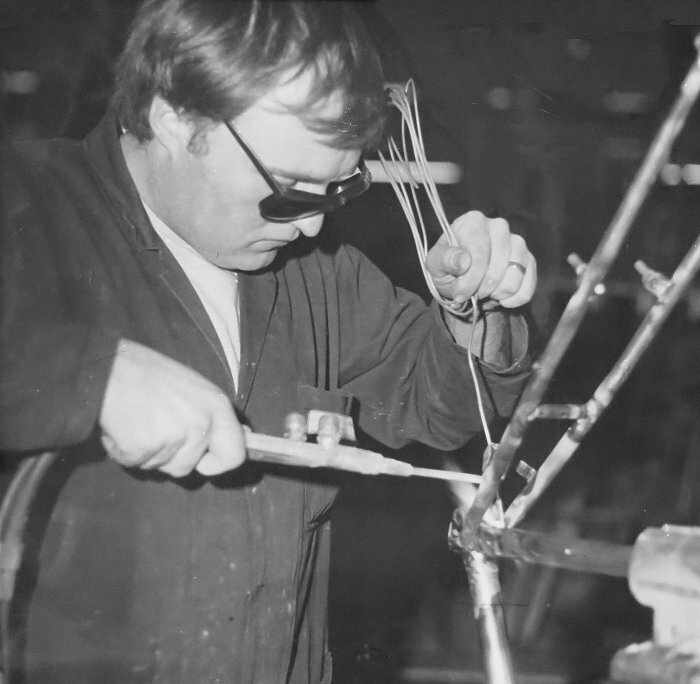 My late cousin Stephen Flavell brazing a frame at Comrade Cycles. He greatly enjoyed working there. 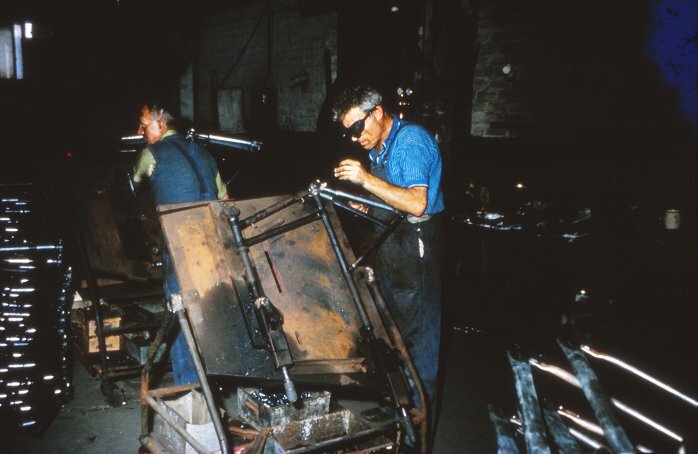 Working on Comrade cycle frames in the mid 1960s. 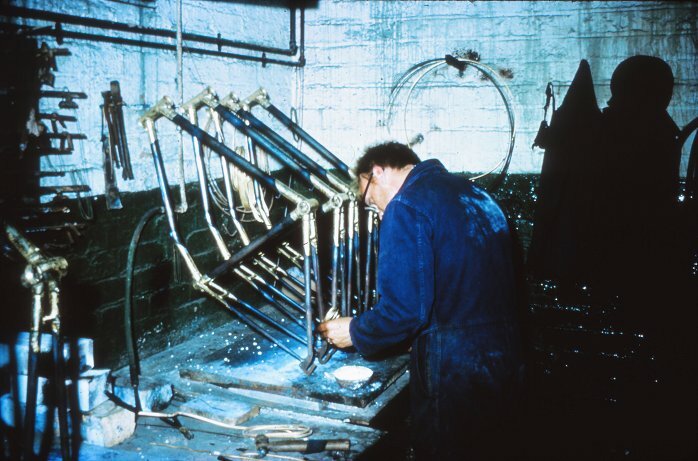 Brazing Comrade cycle frames in the mid 1960s.